Molding compound with good flow property and normal heat resistence. 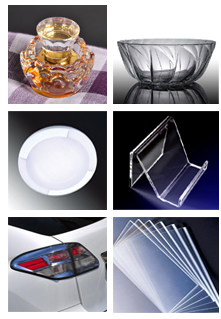 Application: the products with complicated shape and long molding path, such as crafts and housewares. Molding compound with normal flow property, good heat resistence and mechanical strength. Application: the products with simple shape and requiring good heat resistence, such as magnifying glass, nameplate, indicator and container. Molding compound with excellent heat resistence, mechanical strength and good light transmission, low flow property than SX-302. All listed technical data are typical values intended for your guidance.